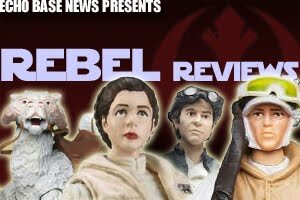 Today's Echo Base News Reviews update includes Barriss Offee from The Clone Wars, a figure with a great sculpt that's highly detailed but unfortunately severely lacking in the articulation department. 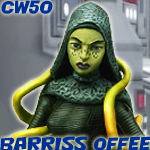 Barriss is a mixed bag of a figure. On one hand, you have to appreciate her intense detail and sculpting, but on the other hand, she has absolutely the worst articulation of any Clone Wars figure. For one, she is a Jedi, so having no elbows or knees is unacceptable. It's sad, I really like female Jedi figures but they can't keep coming out like this after Season 3.5 Ahsoka has come out with elbows and knees. I get that sometimes you need to cut costs, but I feel like costs were cut too much on her. Her inability to move her legs inhibits standing, minus one actually kind of cool pose I found, but I digest. It doesn't make up for it being a bad toy. But...on the other hand (my favorite phrase when it comes to this figure, I guess) her detailing is excellent. Her costume has great...ribbing? and her hood/cape (two separate pieces as the cape is removable but the hood is molded onto her head) have a great texture to it. Her paint job is well done, no complaints to be found. She has a communicator sculpted into her arm and it looks great. Even her soft goods are extremely well done, and they have the appropriate amount of flair without frizzing out and flying all over. The brain worms are great accessories and can be attached to any part of Barriss to recreate her getting taken over by the freaky little suckers. They are great accessories and add a bit of value to the package. Bottom line: You can get the brain worms in the Brain Invaders DVD pack, so don't get the Barriss if you're not a statue fan. Kids won't like this figure.